Curious about passion fruit? It’s delicious and packed with nutrition!! Passion Fruit helps you lose weight! : There is only about 50 calories in one passion fruit, making it an ideal weight loss food if you substitute it for other foods. It’s a great source of fiber. Passion fruit is almost one third fiber, which helps lower cholesterol levels, regulate your blood sugar levels and clean out your colon. It’s a rich source of antioxidants. Antioxidants protect your body from free radicals, unstable molecules that can damage your cells when they are present in large numbers. In particular, it’s a rich source of vitamin C, beta-carotene and polyphenols. 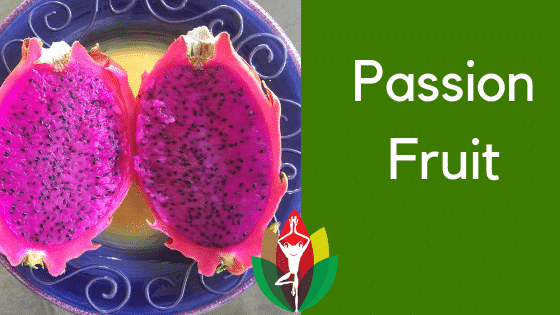 Passion fruit has been shown to have antioxidant and antifungal properties. Passion fruit seed fiber has been shown to be effective in improving intestinal function and health and may help reduce cholesterol. Purple passion fruit extract has been shown to reduce anxiety-related behaviors in laboratory rats without disrupting memory process. A preliminary screen of 1,220 Brazilian rain forest plant extracts from 352 plants found that passion-flower plant family extracts were among the few that demonstrated cytotoxicity against human prostate cancer cells. The flesh and seeds of purple passion fruit are edible, but the skin should not be consumed since it contains a small amount of cyanogenic glycosides (a source of cyanide). Looking for Individual Weight Loss or Nutrition Support? WholeFrog™ can help you achieve lasting results and give you an individualized plan. R.N’s and Licensed Professionals on staff. We have 3 ways we can help! Book a free consultation here or call us at 805-531-9275.